A 7 knob candle is used to obtain wishes and draw something towards you. Choose a candle color that corresponds to your desire. 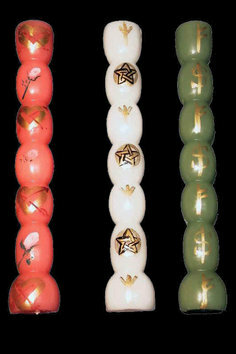 Green for prosperity or luck, red for strength, courage and protection and white for purity, or as an all-purpose candle. Beginning at the bottom knob, carve your desire using words, pictures, runes etc into each of the 7 knobs. Dress the candle with Drawing Oil. Bring to me, my desire.